Rapid innovation in science and technology has led to the development of new fields that transcend traditional disciplinary boundaries. Previous studies have retroactively examined the emergence of these fields. 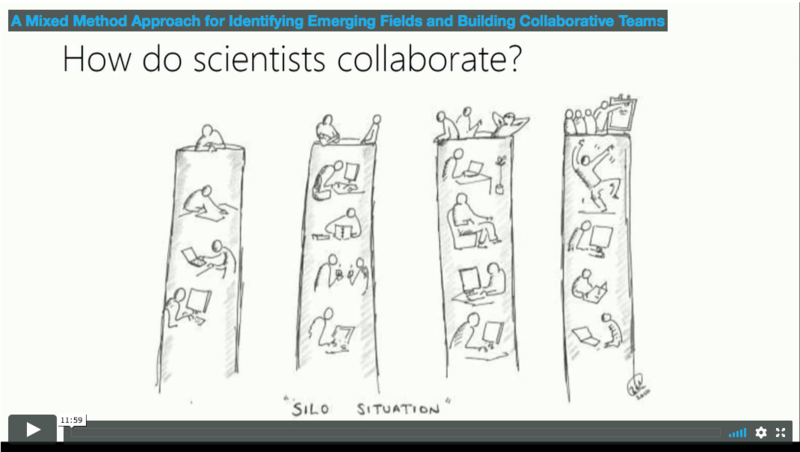 This paper outlines a mixed method approach for using network ethnography to identify emerging fields as they develop, track their evolution over time, and increase collaboration on these topics. This approach allowed us to simultaneously analyze organizational trends and gain an understanding of why these patterns occurred. Collecting ethnographic data throughout the course of the study enabled us to iteratively improve the fit of our models. It also helped us design an experimental method for creating new teams in these fields and test the effectiveness of this intervention. Initially, organizational leaders were wary of using a network intervention to alter these fields. However, by presenting insights from both our network analysis and ethnographic fieldwork, we were able to demonstrate the strategic need and potential impact of this type of intervention. We believe that network ethnography can be applied in many other research contexts to help build strategic partnerships, facilitative organizational change, and track industry trends.